There is nothing more dramatic or satisfying than holing a 20-foot putt. There’s nothing more dispiriting for the opponent watching this feat of nerve and technique, either. On moments like this matches can be won, tournaments decided. The flip side is the short two- or three-footer than looks like a shoe-in but slips tantalisingly past the hole. On the professional circuit, moments such as this are met with a collective groan from the crowd. They can also result in the psychological advantage switching decisively to the opponent. Why do these short-putt disasters happen? After all, even for the relatively inexperienced golfer, these are not the type of shots that appear to represent too much of a problem. There are no green contours to make allowance for when setting up the shot. The speed of the green due to hot weather or rain will have little or no influence. And there will no cross-winds to usher the ball away from its designated course, either. All too often, the problem is that a player rushes the shot. Even the easiest looking tap-in requires you to settle yourself over the shot, take time to clear your mind and concentrate on the task. Fail to do this, and you run the risk of compromising your technique and preventing a nice clean contact between the face of the putter and the ball. The best way to avoid these problems is to practise, to the point where almost without thinking you follow a set routine when addressing the ball for a short putt. These practice sessions will also allow you to look at which part of the hole the ball tends to be hitting. Of course, dead centre is the ideal spot, so if, for example, the ball is tending to rolling to the right- or left-side, analyse why this is happening. What are your feet doing? Are you remembering to get your hands right? Perhaps the problem is that you are tightening on the backswing, or pulling the follow-through short. 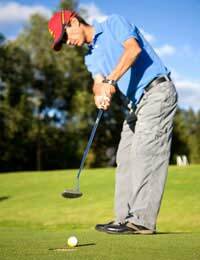 Any of these technical faults can result in a less than perfect contact with the ball. Don’t underestimate the psychological side, either. The fact of the matter is that no-one expects a golfer of reasonable ability to miss a two- or three-footer. Opponents may not even pay much attention to your shot because a miss is a long shot. Compare that with the seemingly impossible shot from the edge of the green: the degree of difficulty means the player knows there is little or no expectation of them holing out; they are, therefore, more relaxed and able to better execute the shot. No wonder that on occasions the ball finds the hole. Equally, no wonder that those short putts are often missed. Because they appear relatively straightforward, the fear of failure can have a devastating effect. And once one short putt is missed, you could be well on your way to a case of the yips, which is basically performance anxiety that can manifest itself in a number of ways. So do take time to address your short putting. It may not be the stuff of fairy-tale endings or leave playing partners in awe of your ability on the green, but it will ensure that closing out holes becomes second nature.